Sudden unexpected infant death, including Sudden Infant Death Syndrome, is the leading cause of death in infants one month to one year of age, in the developed world. A thorough investigation is crucial for accurate diagnosis. As part of the Diagnostic Pediatric Pathology Series, this book provides a detailed guide to various diagnoses and strong frameworks across continents, for strong support in conducting a multi-professional approach to the physiopathological mechanisms behind SIDS. Offering sensitive consideration for parents in mourning, this book rigorously explores current standards of police investigation and post-mortem, incorporating all aspects of the investigation, including the home visit, medical history and autopsy findings. 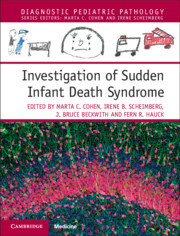 Written by multidisciplinary experts, this vital guide uses clear reference tables and diagrams to present cutting-edge knowledge for use by pediatric and general pathologists, paediatricians, medico-legal practitioners, and all involved in the investigation of sudden infant death.